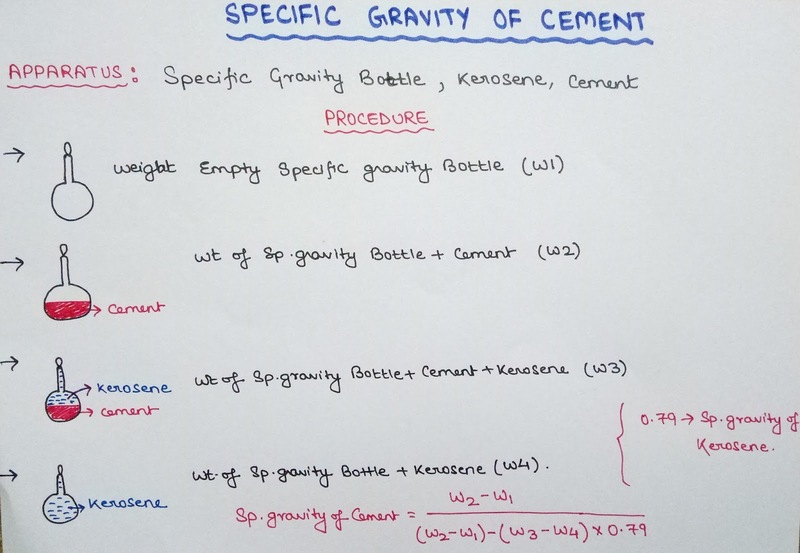 The object of the experiment is to determine the Specific Gravity of Cement by Specific Gravity Bottle. Specific Gravity of cement is the ratio of the mass of unit volume of cement at a stated temperature to the mass of the same volume of gas free kerosene at a stated temperature. 1. Weight empty Specific Gravity Bottle. 2. Fill the half Specific Gravity Bottle with cement and weight it. 3. Now fill the remaining half portion of Specific Gravity Bottle with Kerosene oil and weight it. 4. Now empty the Specific Gravity Bottle and wash it properly. Then again fill the bottle completely with Kerosene oil and weight it. WHERE, 0.79 = Specific Gravity of Kerosene oil. sir please make a video on IS 456-2000 on various designs to find table with page no. it will be very helpful to all engineers.regards. Sir plz provide me Ur contact number, I have several doubts.. plz sir help me out..